Going slow, but still going! Finally, the Achilles surgery is over! It’s been 9 days since the surgery. It’s been a little slow going since the procedure, but at least I am still going and plugging along. The morning after. After the block wore off. It was a pain I cannot describe and hope I never feel again. Dr. had prescribed OxyCodone. I’d started taking it the minute I got home to stay ahead of the pain. I also had some anti-nausea meds in case the Oxy made my tummy upset. the night before, I slept well and woke at about 3am noticing that the block had worn off. Took more pain meds and back to sleep. About 9am Thursday, I was begging for more drugs and my mommy. LOL. Jason, my husband, called the office and they prescribed a couple of days’ worth of OxyContin. A couple of doses of that stuff and I was able to cope. I took 1 every 12 hours when needed. I gritted my teeth when the pain would get too hard to endure and just tried breathing through my nose and exhaling through my mouth. I am not too proud to tell yall that the pain I felt made me cry like a baby. The next couple of days weren’t too terrible. 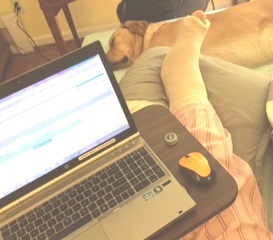 I am able to work from home while I recuperate, so I was able to catch up on work tasks, from my bed and with my foot elevated. My family would bring me breakfast in bed and make sure I had all I needed. My teenager gets home mid-afternoon, so I was really only alone for a few short hours per day. I did experience one episode while trying to get back to my bed from the restroom. My crutches got away from me and lost my balance for a second. I put my toe down and it was horrendous:( Let’s not do that again, I told myself. Put a plastic (empty) square-shaped cooler in the bathtub so I could sit on it. Hey- we don’t have one of those benches, so we made due with what he had! Prop my bad leg up over the side of the tub and onto a lawn chair. Doesn’t EVERYONE have a pink lawn chair in their bathroom? Tuck shower curtain between my knees so I didn’t get water all over the place. Our shower head is detachable, so I was able to sit, enjoy a nice hot shower, wash my hair and shave my one leg. LOL. Getting out was a chore for the first bath because I was still so incredibly sore!But the baths after that just got easier as the soreness went away. 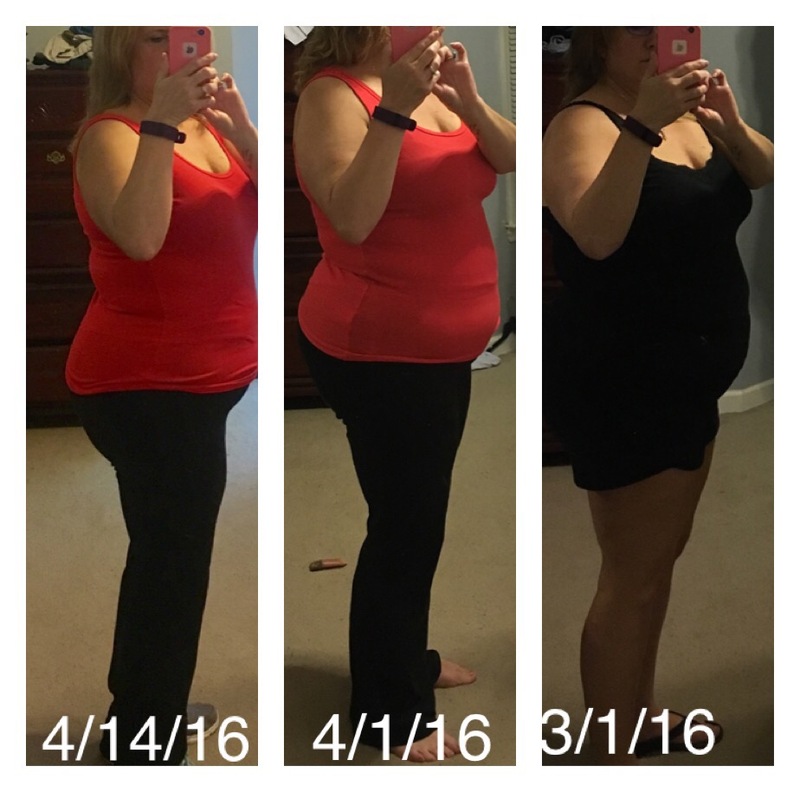 Progress along to Day 7 and then the terrible awful happened. I fell. The bathroom floor was wet from previous shower my dear daughter had taken. We didn’t see water on the floor:( My right crutch flew out from under me and I caught myself with my bad foot, that at the time, was still in a splint, wrapped by an ace bandage. I was good at getting to and from restroom by myself, so by this time, I felt pretty good. I am fairly sure I woke up dead people with the sound and pitch of my scream of terror. I caught myself and put ALL of my weight on the bad foot. ON a scale from 1-10 with 10 being worst, the pain was a 7million. And of course, my poor daughter felt horrible She was home with me when I fell. She heard the screams from hell and experienced the crying meltdown as she helped me get back to my bed. Besides the pain, I was worried I’d damaged something. How could that kind of fall with that level of pain NOT cause damage? I don’t know, but it didn’t cause any! I took some pain meds, called it a day and rested the entire rest of that Wednesday. The very next day (yesterday) I had a scheduled checkup. Dr. Reinke said all looked well and I couldn’t believe the size of the scar! And I couldn’t believe my foot wasn’t more swollen. Because in that heap of dressing/splint, it felt swollen. 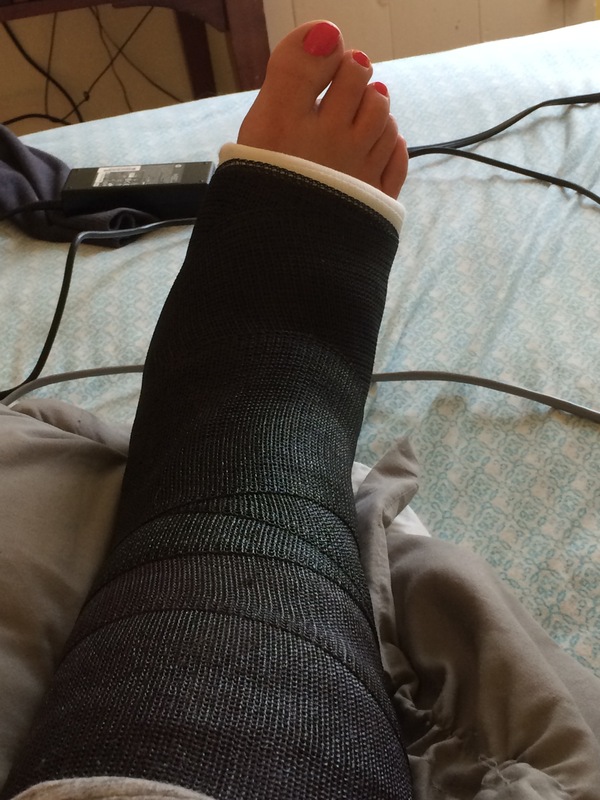 I’ve graduated now to a hard cast. I will wear this for 2 weeks and then will get a boot! Like an aircast thing. I’ve had one of those before. That means I can WALK!!! Praise Jesus. Walking without crutches will be such a joy! And since I can’t really get TO the floor, I have tried some v-ups and leg lifts while on my bed. when I am cleared for exercise on lower extremities, I think I am gonna have a party. LOL. What a glorious day that will be….but first I have to go to physical therapy. Not sure when that is happening yet…but I’ promise I will go SLOW when I CAN go. Running is not ever going to be in my future. I’ll be glad to walk my dog…walk with my family…bike a little, swim a little. NO boxing for quite a while. I am so afraid of kicking the bag and injuring myself that I just can’t fathom boxing or kickboxing for a long, long time- even though that particular exercise was my main weapon in my weight loss journey. 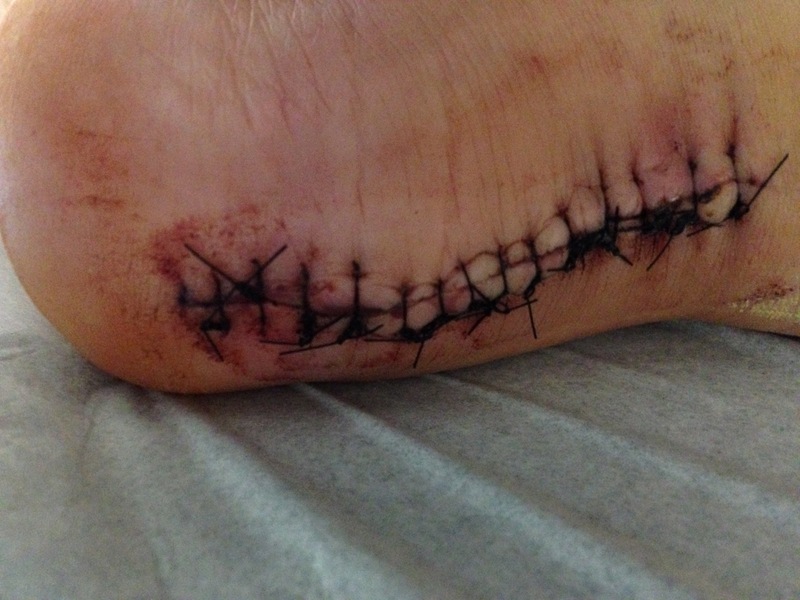 A few pictures from this fun time in my life… these are pics of my incision site and stitches. Ouch! 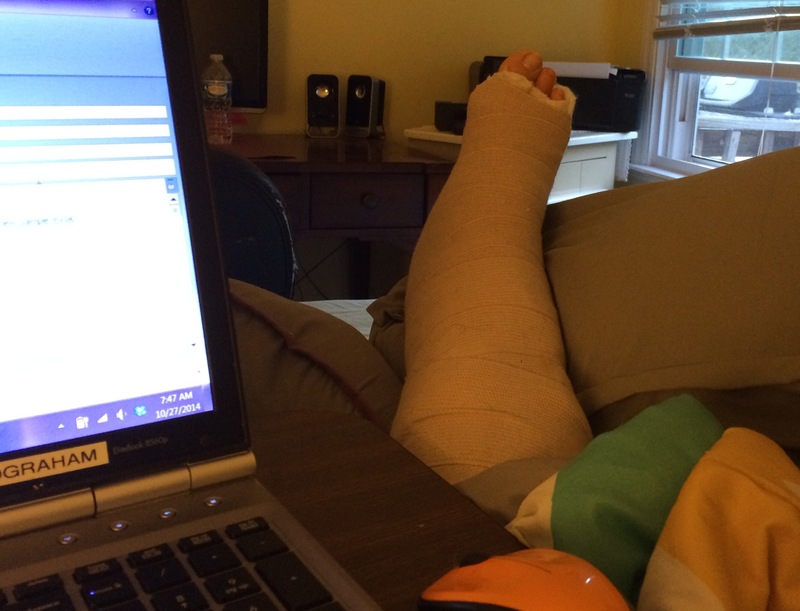 This is how I started my day last Monday and up to this past Thursday.. propped up foot, icepacks, hospital tray/table with my laptop and my phone to my left. My cute puppy would join me most days, too. I can’t sit at my desk yet, so I work from my bed. New Cast I got yesterday. I’ts already working my nerves at night. I still have to elevate it most times. No letting it dangle in seated position too long. It’s better to elevate so that the swelling goes down. I haven’t had pain meds in a couple of days. Feeling good and looking forward to gaining strength! I’ll update again when I get my aircast! My family and friends have been fantastic sources of help during this time. From sending flowers, bringing food for dinner, just a call, text, email, or visit, has meant so incredibly much to me. I am blessed beyond measure. Happy Halloween, y’all! If you and your kids are trick or treating tonight, please enjoy and be careful!